Click here and then type in your email and password. Click here or go to the upper right hand corner and press on the drop down menu and select "Change Password". Either go to the upper right hand corner and click on the drop down menu and select “Edit Profile” or click on the “Home” header and select “Edit Profile” button. What is the difference between Neemos and creators? Neemos are creators with typically a range of followers from 1,000-10,000, while our creators have 10,000+ followers. Neemos content is on par with the big influencers and they work strictly on a product exchange basis. With Cohley's proprietary algorithm we are able to identify these creators before they've hit it big, so working with our Neemos is a great way to generate actionable content at the lowest possible cost. What does the check mark mean next to creators mean? The check mark next to a creator means that you have worked with the creator on a previous campaign. What is Smart Match? What does it mean when a creator is recommended? Our powerful Smart Match algorithm will feature highly-rated, reliable creators who align with your brand’s values and aesthetic. We encourage you to skim their profile and consider collaborating! Previous brands who have worked with this creator have given them a star rating based on the quality of their content. All creators start with a 5 star rating. How is trending engagement calculated? Trending engagement is calculated by measuring their engagement [(# of likes + # of comments)/# of followers] over their last 30 posts to give you an accurate depiction of how they will perform in a potential collaboration. What does it mean to click "save", "no" or "interested" on a creator? Interested sends them an email notifying that you are interested/would like to work with them. Saved puts them in the “Saved” drop-down and stores them for later. No puts them in the “No” drop-down. How do I sort through creators? How do I directly chat with a creator? Go to the “Discover” tab and go to “Interested” and then “Interested in me” and click on chat button right above the “Invite to Campaign” button (all of these creators have individually expressed that they would like to work with you). You can also initiate the relationship by clicking “Interested” in the discover tab above “Invite to campaign.” They will get a notification that you are interested and decide whether they’re also interested in working with you. If they are, they will show up in the “Interested in Me” tab and you can chat them from there or invite them to a campaign. What do the medals mean? How can I see what medal the creator has? When clicking on the creator's thumbnail, it will open up to their profile page where the medal will right next to their name. There are 4 different medals that a creator can have depending on their activity on Cohley: gold, silver, bronze or no medal. Go to the "Campaigns" tab and click on "Add New Campaign" button and fill in all desired requirements for your campaign and then press submit. Go to the "Campaigns" tab and click on the campaign that you wish to edit and then on the right side click "Edit Campaign". Can a creator see if I decline them for a campaign? No, creators are only notified if they are accepted into the campaign. Also, if you decline someone at first, you can always bring them back if you change your mind by selecting "Add Back to the Campaign". How can I clear my campaign notifications? Depending on what stage in the campaign the creator is in determines the way in which you can remove the notification. If the creator is in the "Chat" section clicking "Not Now" and/or clicking into the chat box will get rid of the notification. In the rest of the sections of the campaign clicking into the chat box should get rid of the notification. What happens if a creator misses a "Post By" deadline? The Cohley Customer Success team will be in contact with you working through this situation on how to deal with this creator. In addition, the creator's star rating will automatically be lowered; and if there is a monetary compensation, it will be lowered by 10% each day that they do not post the content. How do I send photos to the Content Library? Go to the specific campaign in the "Campaigns" tab. If you have yet to approve the content, then go to the "Content to Review" tab and click "View Content for Approval" and accept all the ones that you approve of. Then click "Send to Library". If you have already approved the creator's content then either find them in the "Pending post" or "Completed" tab. Click on "View Content for Approval" under their profile and then click "Send to Library" for all desired images. All the images that you have just sent to library can be found in the "Content Library" tab. When I clicked “Send Payment,” an automatic message was sent, saying that the influencer needs to create stripe account to be able to send the payment. What does that mean? The influencer still needs to link their Stripe account to Cohley. You will be unable to pay the influencer until they do so. The automatic message is reminding the influencers to set up their account. Where can I find campaign results? Click the "Performance" tab in the upper right hand corner. You’ll find comprehensive data on engagements, impressions, cost, ROI, and follower growth. How do I invite creators to a campaign? Go to the "Discover" tab and click on "Invite to Campaign" under the creator's thumbnail and select the campaign you would like to invite them to. How will I be notified when a creator applies to a campaign? When you log into your Cohley account, you will see a yellow notification at the top of the “Campaigns” tab, showing the number of new messages and applicants you have received for the corresponding campaign.. If you have not responded to any notification in 24 hours you will get an email informing of all current notifications. How do I move a creator in status in a campaign if there is no content required for the campaign? Go to the "Campaigns" tab and select the campaign. Go to the tab that the influencer is in, either: Accepted Creators, Content to Review or Pending Post. Click on "Move Chat" of the influencer you wish to change the status of and then select the desired location. Can I pay a creator directly in Cohley? Yes! You can compensate creators for a paid campaign directly in Cohley through your Stripe account. Once a creator has completed a campaign, they’ll automatically move to the Completed tab. 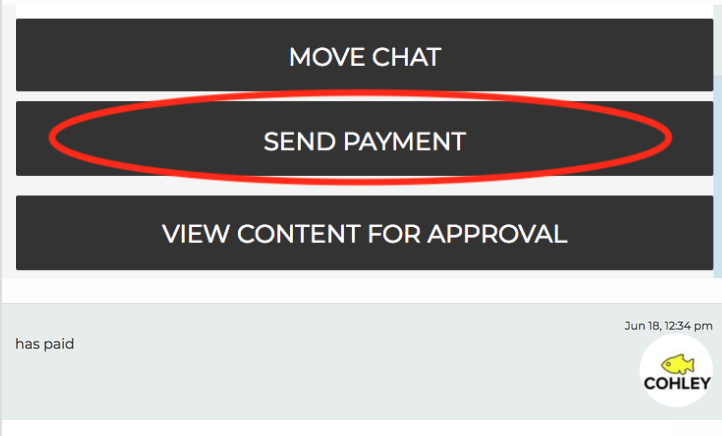 From there, you can click “Send Payment” under the creator’s name and login to your Stripe account for payment. There will be an automatic confirmation message sent in the chat that tells the creator you have paid them. How do I make a Cohley Creation? After navigating to the Content Library and selecting the Cohley Creations tab, click the Create Ad button in the top right corner. From there, select at least 2 photos to feature in your video (4-6 usually work best). Once you’re finished click NEXT at the top of the page. You’ll be able to control timing, photo order, and preview your ad before reaching a final product. Use the dropdown menus below each photo to adjust timing for each photo. Use the adjacent arrows to reposition photos in the sequence. Once you’re happy with the video, select Finalize and Create. After the green success window pops up, you can navigate to the published video page. You’ll be able to access, download, and share all of your AdSequences in the Cohley Creations tab. Where do I find campaign analytics? When hovering over the "Performance" tab, you can either select to see Engagement Data or Revenue Data. How does performance data get added to the performance tab? When influencers submit their post links in Cohley, the post data will automatically populate in the Performance tab. You can also manually upload post links by clicking “Add Performance” in the Performance tab. How can I time slice analytics in the performance tab? Click on the “Performance" tab and then click “Sort Performance” and simply select your preferred date range.